From all the internationally created comic book work I’ve been reading lately, I’ve noticed that most of the books are very universal. Their stories could quite easily be set in any country with a few tweaks. While it’s heartening to see shared ground between far-flung societies (and wouldn’t that make Thomas Friedman proud), there are some books that are improved by how much different they are from the comics we typically see and how their story couldn’t possibly be set anywhere else. All of that, then, is my overly long buildup to today’s entry into our ongoing look into the wide world of comic books. As with some of the previously mentioned books, today’s comes from First Second Books. 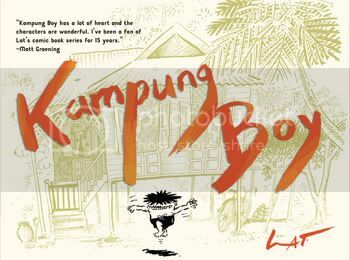 Kampung Boy, by Lat, is a fictionalized memoir of Mat, a Malaysian boy who is born and raised in a little village in a remote rural region of southeast Asia. By turns, it’s insightful, funny and touching. The book jacket makes a comparison to Charles Schulz, and it’s not an egregious stretch. Kampung Boy is not so much simple, but simply entertaining. The book begins with Mat’s birth and follows through his early years to late childhood, when he leaves home for a distant school. In the 120 or so pages between the moments, Lat takes his near-namesake through a string of slice-of-life adventures. With no dialogue and straightforward narration, he describes some memories that anyone can relate to: going fishing, fighting with parents, not understanding parents, etc. A big part of what makes this book so enjoyable, though, are all the other stories, the ones that set it very distinctly in southeast Asia. In telling the strange ceremonies that follow a birth, and the little details of how people lived, and the Islamic education, and even the very different ritual of circumcision, Lat gives readers a full on immersion into the every day lives of people in rural Malaysia. It takes a strong writer to take something that could be a very dry account and balance the informative side with the storytelling and humor, and Lat strikes that balance quite well. The book is probably worth a look also just for the art. The black and white illustrations take up a single (horizontal) page each, showing one scene. Lat fills out backgrounds fully, adding little details to further the picture. His characters rise to the surface, though, infused with a squirmy liveliness. They’re rendered in a sort of abstract, basic way as Schultz did with Peanuts, but I’d compare them more directly to a combination of Sergio Aragones and Gahan Wilson. Everyone is just thoroughly alive and expressive in a way that only comic-strip-style art can convey. Unless you bear a deep, burning spitefulness for Malaysia, I’d recommend Kampung Boy. If you do hate Malaysia, well, that’s just weird.